Investigating Science Communication in the Information Age is a collection of newly-commissioned chapters by leading science communication scholars. 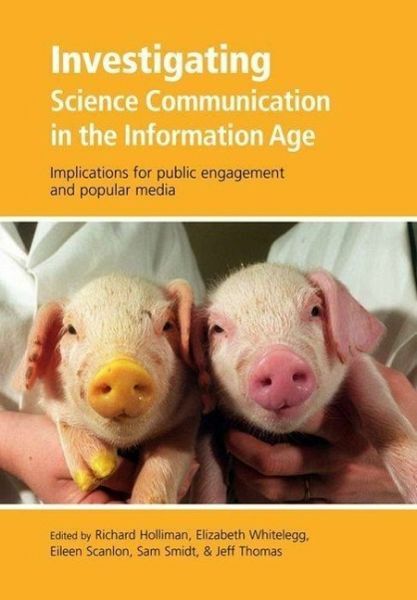 It addresses current theoretical, practical and policy developments in science communication, and engagement and dialogue on the part of professional scientists with members of the public. Richard Holliman is Senior Lecturer in Science Communication at the Open University (OU), UK and production course team chair of Communicating Science in the Information Age. After completing a PhD investigating the representation of contemporary scientific research in television and newspapers in the Department of Sociology at the OU, in 2000 he moved across the campus to the Faculty of Science. Since that time he has worked on a number of undergraduate and postgraduate course teams, producing mixed media materials that address the interface between science and society. He is a member of the Centre for Research in Education and Educational Technology and is currently leading (with colleagues) the ISOTOPE (Informing Science Outreach and Public Engagement) and (In)visible Witnesses research project teams. Elizabeth Whitelegg is Senior Lecturer in Science Education working in the Science Faculty at the Open University (OU), and Award Director for Science Short Courses. She recently produced (with Professor Patricia Murphy) a review of the research literature on the participation of girls in physics, for the Institute of Physics. Her main research interest is in girls' and women's participation in science and in learning science (particularly physics) at all levels; she is currently leading (with colleagues) the (In)visible Witnesses project. In 2003 she was invited to become a Fellow of the Institute of Physics. Eileen Scanlon is Professor of Educational Technology and co-Director of the Centre for Research in Education and Educational Technology at the Open University. She is also Visiting Professor in the Moray House School of Education at the University of Edinburgh. Sam Smidt is a senior lecturer based in the Department of Physics and Astronomy at the Open University, and Programme Director of the MSc in Science. She has interests in physics education and outreach work in promoting science to the public. Jeff Thomas is a senior lecturer within the Department of Biological Sciences at the Open University. He has worked at the OU all his professional life, contributing to a wide range of teaching initiatives in biology and in health sciences, and more recently to a range of projects concerned with contemporary science issues and on the relationships between science and different publics, at both undergraduate and Masters level. His research interests are concerned with the influence of contemporary science controversies on public attitude, on conceptual problems of learning biological science, and in public involvement in science-based policy-making. He also teaches part-time for Birkbeck College, University of London on its Diploma in Science Communication.